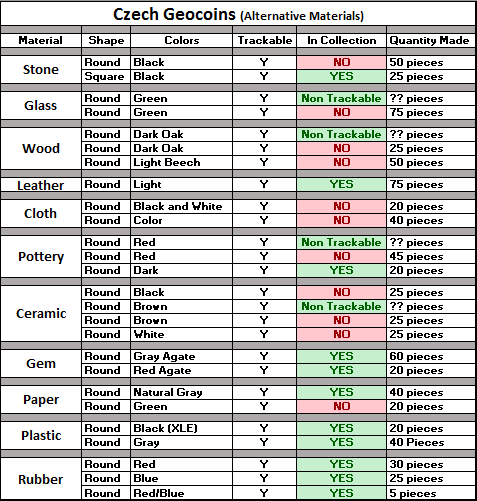 Does anyone have a complete list, including variants of the Czech geocoins made from unusual materials? Interest in geocoins decreased drastically when Groundspeak allowed these type "trackables" to be listed as "geocoins"
Nah, they still count as coins in my book. I love this series. I hope he continues it. Still looking for the Round Stone, Light Wood, and Cloth with Red ones. Anybody got them? Activated is ok.
JB, FWIW I think several factors were in play that caused the apparent decline in geocoins: Glut of product as the economy tanked and people didn't have the money they once did, and FaceBook stole the Forums' thunder/near monopoly on coin news. Older designers quit, and the ones that replaced them didn't have the foundation of the forums. Pathtags satisfied the Geocoin itch for many folks in a huge way. Getting your own shiny metal objects made at 1/10th the price of coins is awfully attractive to a lot of people. Driving out any discussion of anything not trackable on geocaching.com turned a lot of people away from the forums and was a big mistake in my opinion. Demand for shiny metal objects is still there, it's just not here like it once was, it's been spread out across other sites and venues. It's a different coin world than it was 5 or 6 years ago. Known that this is not Facebook. But I like your posting, Six Little Spookies. I've searched for several years now and the initial list provided was the information I was able to confirm. However, I currently have in my possession 4 non-trackable versions. I notified the creator that I had these and he seemed surprised to find that there were "Non-Trackable" versions out here. Attached is the list of our collection and we are always looking to find the ones we are missing.